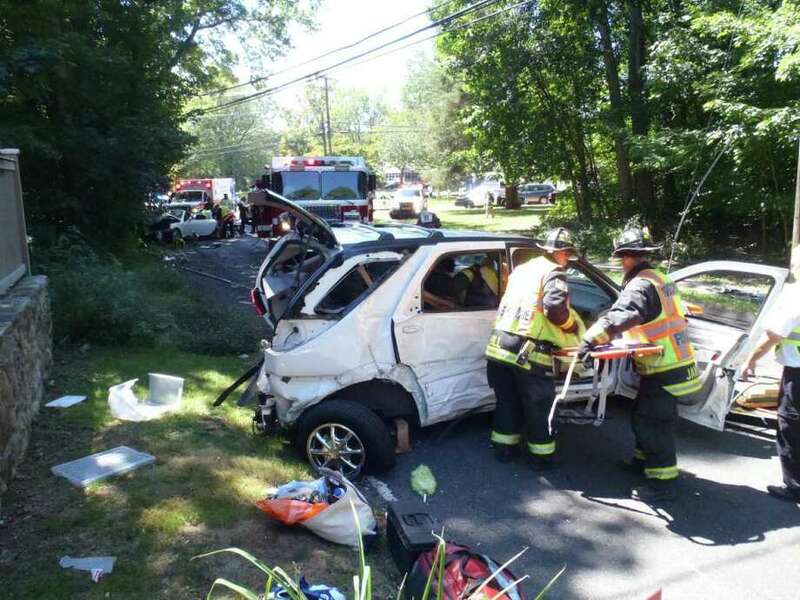 A serious two-car crash at Easton Road and North Avenue in Westport on Monday afternoon required firefighters to use the "Jaws of Life" tool to extricate one of the drivers from the wreckage. A serious traffic accident injured two people -- one of the drivers had to be extricated from the wreckage -- and disrupted traffic Monday afternoon on Easton Road. Three cars collided on Easton Road, at the intersection with North Avenue, about 12:30 p.m. Two people were transported to the hospital with injuries by Westport EMS. One victim was extricated from her vehicle by Westport firefighters using the "Jaws of Life" tool. Easton Road was closed until 2:30 p.m. while police investigated the accident. Westport fire said a shift commander was pulling into Coleytown Fire Station 6 when people ran up to him to report a serious crash nearby. Command Car 3 responded along with Rescue Company 3 and Engine Company 3. Police were also quickly dispatched to the scene.